ISBNs, LCCNs and Copyright — Oh My! No matter how long you try to put it off, you will at some point need to deal with the copyright page in your book (meaning you need an ISBN and perhaps an LCN), and with obtaining the ISBN and bar code for your book cover. Here is a primer about ISBNs, LCNs, and copyright. Think of the ISBN as a model number. If anything about the product is different—for example, hardcover, softcover, eBook, or audio book—a different number is needed. Most authors need at least two ISBNs: One for the print book and another for the eBook. 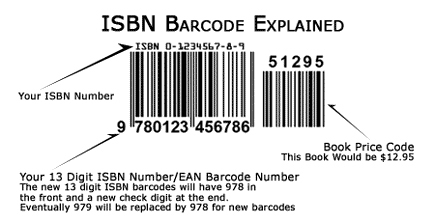 The remaining ISBNs can be used for future editions of this book or any book you publish in the future. Single ISBN numbers may be sold through a third party. If they go out of business, your identity as the publisher of this book disappears with them. Never purchase ISBNs from any source other than Bowker if you are in the USA. If 1106 Design is designing your book cover, it’s not necessary for you to buy the bar codes offered by Bowker. We’ll make the barcode for you for free. Once you get your ISBNs, and your book details such as trim size and page count are finalized, the next step is to go back to Bowker and assign one of your ISBNs to your title (otherwise they won’t know). This action, along with all the other information you’ll be asked to provide at that time, will list your book accurately in the Books In Print database. Note that Bowker does not only sell numbers; it maintains a huge database and offers a suite of services that connect your book’s metadata to subscribers worldwide seeking information on every topic imaginable. Bowker’s website is a bit confusing. We’ll be happy to set up your account at Bowker and purchase the ISBNs for you at a 15% discount ($250.75) and complete the title setup for an additional $150 ($400.75 total). Your LCN can be applied for at the Library of Congress website. It’s a two-step process. You have to apply to apply. No joke. Finally, we get a lot of questions about copyright. Copyright is automatically yours as the author, but there are benefits to officially registering your book with the US Copyright Office when it is complete. See http://copyright.gov for information and http://copyright.gov/forms for the actual instructions to complete registration. What Is the Difference Between IngramSpark and Kindle Direct Publishing? 1106 Design is a Phoenix-based company that works with authors, publishers, business pros, coaches, consultants, speakers . . . anyone who wants a beautiful book, meticulously prepared to industry standards. We offer top-quality cover design, beautifully designed and typeset interiors, manuscript editing, indexing, title consulting, and expert self-publishing advice. Email: Click here to send us an email!